Over the first two play sessions of Gloomhaven, my group found themselves completely incapable of following one of the game’s core rules. Gloomhaven made a request of us that none of us were willing to complete – a blasphemous task that flew in the face of all of our previously acquired board game etiquette. It asked us to rip a card into pieces. “What if someone else wanted to play the game after us?” “What if we needed the card again later?” These questions swirled around our heads, fueling our reluctance. Unable to take part in the willful destruction of a board game, a compromise was made: a card graveyard (in actuality a small cardboard box) in which all “ripped” cards were lain to rest. Placed at the corner of the gaming gable, it served as a reminder of our lack of killer instinct. Gloomhaven is a tactical board game in which players control a party of adventures within a sprawling medieval fantasy setting. Cut from the same cloth as Pandemic: Legacy and Risk: Legacy, players enact persistent changes to Gloomhaven’s world as they slay monsters, complete quests, and level up. This progress can manifest itself as new adventuring locations, marked increases to shared objectives, and even the destruction of certain game elements (such as the dreaded ripping of cards). Despite its impressive total campaign length – estimated at around 100 hours – each play session is divided into a series of distinct quests. 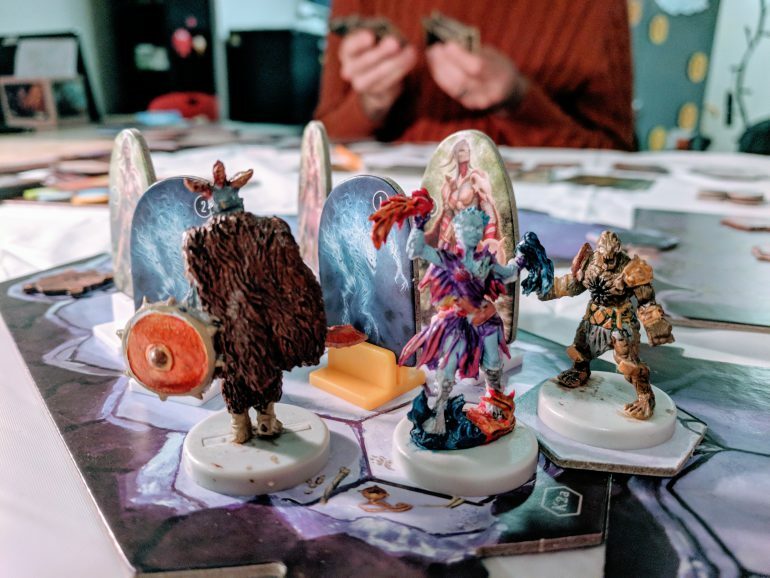 By co-opting the town-travel-quest dynamic prevalent in roleplaying games such as Dungeons and Dragons, Gloomhaven creates a comfortable rhythm for adventure. The decision-making in Gloomhaven is akin to old school text adventure games. When faced with a dilemma, usually provided through an event card or a quest objective, players have the option of picking from a pair of possible outcomes. These outcomes can lead to rewards, penalties, or new options to pursue within the game. Over time, players accumulate wealth and experience, grow in strength, and flesh out an ever-expanding game world. Players can also expect to rip up a lot of pieces of paper. Whereas experienced board-gamers are accustomed to removing elements from play temporarily or shuffling cards back into the deck, Gloomhaven adopts the nuclear option: tearing parts of itself into pieces. Even some of the less aggressive mechanics, such as opening envelopes full of new content or placing stickers on the board, may seem sacrilegious for those who grew up playing Clue or Monopoly. 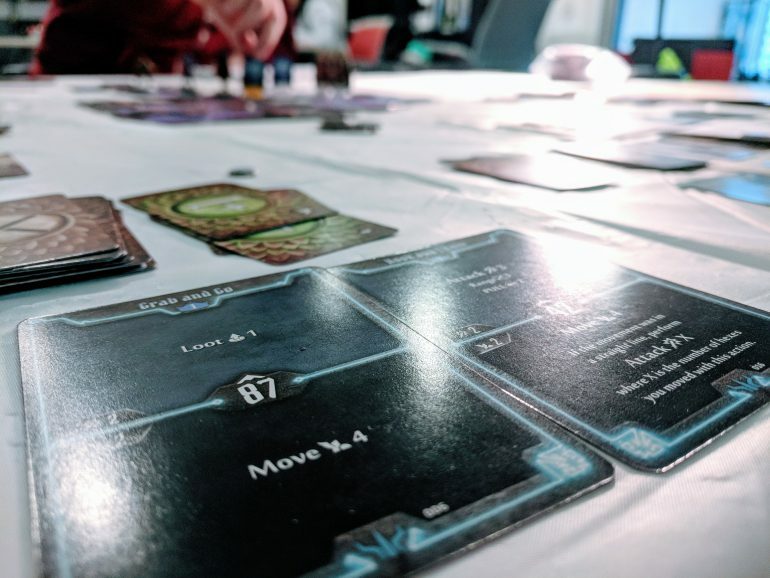 For a gaming audience that long aspired to keep their toys in austere condition, every irrevocable change to the board seems like a transgression – a blemish on an otherwise pristine game. Yet despite many players’ reluctance, this iterative destruction is absolutely essential. Like a rocketship casting off portions of its hull to hasten its ascent, Gloomhaven delivers new content to its players while expending the old. It is almost impossible to settle into a gameplay rut because you never fully understand all of the moving parts. As soon as you think you have a grasp on what’s going on a new location, ability, quest, or item enters play and you’re left scrambling to figure things out. This constant introduction of new content turns the game into a meta-puzzle: players must determine how each reveal benefits their characters, while simultaneously trying to unlock shared objectives with the rest of the group. This type of disposability is certainly not a new concept – Pandemic: Legacy and Risk: Legacy have Gloomhaven beat by a number of years – but it is a novel addition to the dungeon crawler genre. Similar games, such as the venerable HeroQuest and the much sought-after Descent: Journeys in the Dark, often stagnate due to static adventure paths and a reliance on “dice-chucking” to progress the action. Gloomhaven addresses these issues through unlockable content, carefully planned character progression, and a willingness to dispose of elements once their usefulness has been expended. It wasn’t until the end of the third session that we bit the bullet and finally shredded a card. Faced with a particularly annoying quest – one that mocked us with an unwinnable scenario – our fury was released. Instead of joining its brethren in our makeshift graveyard, the card made its way into the garbage can. Rejected, torn to pieces, and never to be played again.